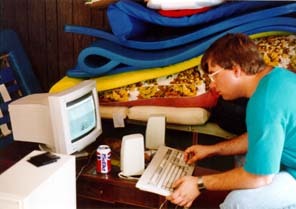 BBS in May 1996 Over the seven and a half years that the BBS was online, a very strong, friendly, and supportive online community was created. Many friendships were formed, and many laughs were shared (remember Dwayne and "Rollo"?). This was probably the most important aspect of Bits 'N Bytes, and it will surely be missed. 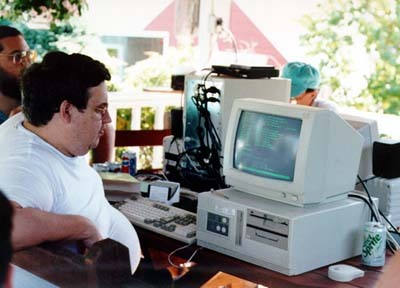 Each summer I hosted the annual "BBS Picnic" at my house. Here we would gather, rain or shine (more rain than shine) with or without our computers and just eat, share stories, and talk about computers. Take a look at my BBS Picnic Photo Gallery! 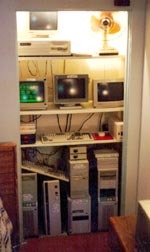 I recall many fun times, including running network cables through the rain so we could play Doom, the annual Amiga vs. IBM competition, and Randy Miller's unique systems.